We’re happy to announce the release of ImageFramer 4.0. We’ve worked long and hard to make it happen. We also have big plans going forward. Batch Processing. Available in the Pro version, the built-in Batch Processor can apply a Template to multiple images. You have control over the format and size of the exported photos. Adobe Photoshop Lightroom Plug-in. This plugin integrates with the Export flow in Adobe Lightroom. It allows to post-process exported photos with an ImageFramer template. We have detailed instruction for Installing the Adobe Lightroom Plugin and for using it. Apple Photos.app Editing Extension. 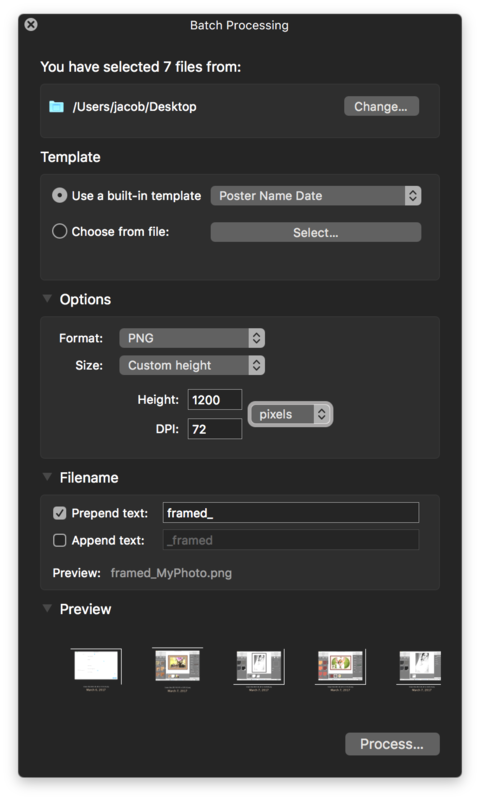 You can now invoke ImageFramer right from Photos app on your Mac. We’ve written instructions on how to enable and use ImageFramer’s Photos extension. With these improvements, we open ImageFramer for better collaboration between all our customers and for more robust workflows in professional environments. Export individual or multiple frames, Frame Sets or entire Frame Collections. These stand-alone files can be shared, sold, or backed up. Export is available in the Frame Editor (requires Pro license). Import of frames is available to all. This opens the door to true collaboration between ImageFramer customers and between you and Apparent Software! Note: Apparent Software’s frames can’t be exported. Current design can be exported to a file. An exported design can optionally include the actual image being framed. This provides a one-stop solution to load an editing session back. These saved designs can be shared between ImageFramer installation s. Make sure the other ImageFramer installation has in its Library all the frames that are used by the Template. Designs can also be exported from the Templates sidebar. These will not include any image but will include all the keywords assign to the template. Template files can be opened from Finder to immediately apply them to the current open design. Template files can also be imported into the Templates sidebar for reuse. These two features make sharing and collaborations easier. You can design your own frames and designs that go with them and share them with others, free or not. To make sure you don’t miss new frames and templates from Apparent Software, subscribe to ImageFramer Newsletter or follow our Facebook page. This is a longer list of individual changes in version 4.0 that are either new features, improvements or bug fixes. Snapping of text and image Overlays to the edge or the center of the design with ease. New “Scale” control to full-frame frame types. This allows some frames, like those with a small opening in the middle, to be more useful. Design option to save framed images with their external shadow intact. ImageFramer Library panel adds a “Recent” tab, which lists frames that were either recently used by design, or edited in Frame Editor, or imported. A real time-saver. ImageFramer “Recent” and “Favorite” tabs in the Library panel now contain a “Show in Library” pop-up menu item to quickly navigate to the frame in the “All” tab. Another time-saver! ImageFramer “Library” panel can now filter frames in the current list by their name. Saving you time, once again! 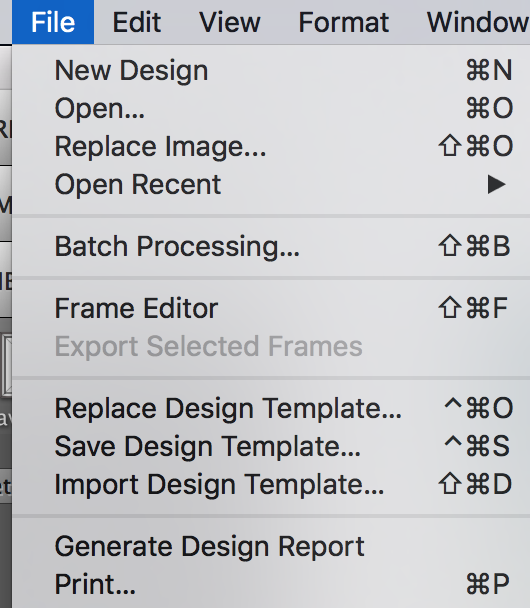 ImageFramer “View” menu saves preferred presentation settings (background colors and zoom). These settings will be used for all new windows and be quickly restored. Sharing extension to open images in ImageFramer from any application that allows sharing. Should be enabled first, from a More… action of a Share panel or from Extensions System Preference. 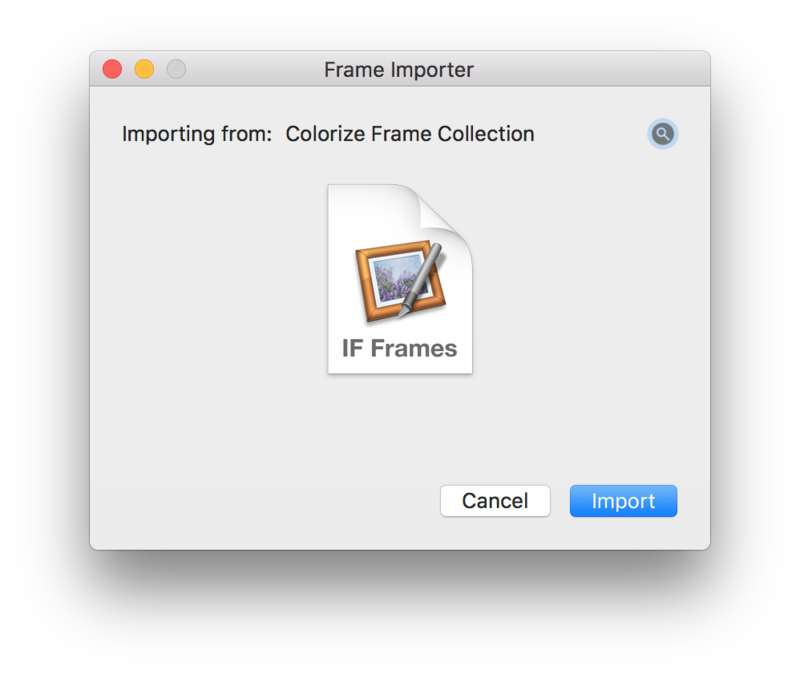 A “Welcome to ImageFramer” screen. A new set of default frames. A new set of default templates. Added “Duplicate As Mask” command in Frame Editor. Added A4 and Letter paper sizes to Aspect Ratio list. Allow saving opened images in-place with Save. Helps with editing from external tools like Lightroom and is more conforming to the expected behavior for macOS applications. In Text Overlays, background color automatically adjusts based on the color of the text to keep it visible. No need to manually toggle between light and dark backgrounds now. Changing the text color is now simpler, with a new dedicated Color button right by the text field. We’ve added “Page Size” and “Copies” to the Print dialog. The images used in image overlays are now embedded within their design templates. No need to keep the original image. Templates in the Templates panel are now sorted by name. This allows you to find them easily and better manage their order by adding prefixes to names. Removing, adding and renaming of Templates in the Templates panel can now be undone via the Edit menu (or Command-Z). Layer-strip icon for text layer will now use the same background color as the text field, providing better contrast. Mouse Scroll-wheel (or two-finger up/down swipe) resizing of frame layers will now work for the currently selected layer in the strip, (instead of the layer under the cursor) making scrolling work more predictably. Molding frame layers now add a new attribute in Frame Editor called “Mirror images.” This allows for easier creation of repeatable frame patterns by “mirroring” the image of the frame on each subsequent repetition, forcing the edges to align. For some frame types (like wooden and other textures) it saves you from having to spend a lot of extra time in a graphics editor working out the frame graphics by hand. Mirror images can also keep the graphics file size smaller, saving space and memory. Color Mat layers will display actual colors of the mat in the filmstrip, instead of their original color in the Library, if the latter was modified. Cancel eye-dropper with Escape key. We want everyone to enjoy the benefits of the new ImageFramer. ImageFramer 4.0 is a free upgrade for ImageFramer 3 customers. Note that it requires macOS 10.11 (El Capitan) or later. That being said, if you appreciate our work and would like to support ImageFramer’s further development, we now have some options to help us, and get some special benefits as a result. Read the details in this article on our blog. Please take a look. Lastly, enjoy this short 1-minute video of ImageFramer in action.